The two sides had been negotiating at Workplace Relations Commission. NEGOTIATIONS BETWEEN BUS Éireann management and unions representing the workforce have collapsed, meaning that the threat of industrial action looms large. Both sides had been involved in talks at the Workplace Relations Commission (WRC) in an attempt to reach a deal over the contracts and conditions of workers. The National Bus and Rail Union (NBRU) today released a statement accusing company management of deliberately collapsing the negotiations. The union said that it had put its workers on notice that it will immediately engage in all-out strike should Bus Éireann alter the conditions of workers. General secretary of the NBRU Dermot O’Leary stated that the company had turned up the negotiations “ill-prepared to fully engage in a manner which would subscribe to a possible solution”. Siptu trade union has also said its members are ready to strike following the collapse of the talks. “If Bus Éireann tries to force through cuts our members will have no option but to take strike action to save their jobs and protect public transport services,” said sector organiser Willie Noone. Both unions called Transport Minister Shane Ross to intervene in the dispute. 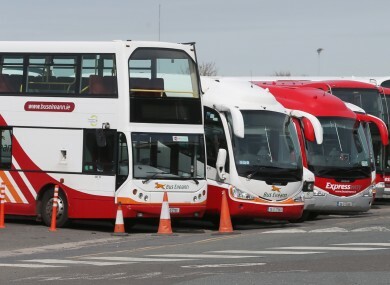 In a statement, Bus Éireann said that the unions had “refused to negotiate” on the terms and conditions of employees’ contracts and this meant that fears of the company becoming insolvent could not be addressed. It also said it had “put every conceivable issue on the table” in an attempt to address its significant losses. “The unions’ response to date has been to refuse to negotiate any change to terms and conditions, insist on a pay rise and seek compensation for staff who may have had a reduction in overtime earnings over the last few weeks,” the company said. We will now seriously consider our position and advise our staff in due course of the necessary steps which must be taken to avoid insolvency. The collapse comes after unions yesterday criticised the company for releasing a document to workers warning of increased losses at the company while talks are ongoing. The document – seen by TheJournal.ie - states that projected losses for 2016 at the company have now increased. The company states that it is looking at an estimated operating loss of €9.4 million for last year. It states that losses for last month are already in excess of €1.5 million. Strike action was averted on Monday as both sides agreed to meet at the WRC to continue talks. The company is also believed to be seeking the closures of the Dublin-Derry, Clonmel-Dublin and Athlone-Westport routes. Roscommon TD Michael Fitzmaurice says that such a move will not be tolerated. “Any closure of rural bus routes must be resisted by public representatives in rural Ireland and in the West in particular. I attended a plan for the West and Rural Ireland to 2040 recently and there was great talk about how we can progress into the future. TheJournal.ie has contacted Bus Éireann for a statement regarding the collapse of negotiations. Email “Bus Éireann workers ready to strike as talks between management and unions collapse”. Feedback on “Bus Éireann workers ready to strike as talks between management and unions collapse”.